Fionnuala McCormack ran a personal best at the Boston Marathon and only just missed out on qualification for Tokyo 2020 – barely six months after having a baby. The top ten in Boston earned themselves automatic spots at next year’s Olympic Games. McCormack finished in 11th with a time of 2:30.38. Her previous best mark was 2:31.22 when she made the top 20 at the Rio Games in 2016. Late last year the 34-year-old gave birth to her first child, a daughter named Isla. 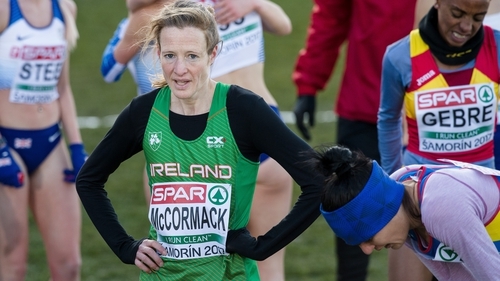 McCormack has been showing excellent form recently as she chases qualification for Tokyo. The women’s race was won by Ethiopia’s Worknesh Degefa in 2:23.31 ahead of Kenyan Edna Kiplagat and Jordan Hasay of America. Kenya’s Lawrence Cherono led home the men’s race in 2:07.57 with his compatriot Kenneth Kipkemoi in third behind Lelisa Desisa Benti from Ethiopia. The Boston Marathon, one of the most prestigious 26-mile races in the world, was once again run in terrible conditions with rain, wind and low temperatures making fast times difficult.